In the months following the presidential election, a surprising number of well-known American brands got political. "The Obama administration turned a deaf ear to us, and frankly, with President-elect Trump, we feel things are going to move in the right direction," Vice President of Public Affairs Matt LeBretton said to The Wall Street Journal on Nov. 9. The remark was a trending topic on social media within 24 hours as staunch opponents of President Trump rallied to punish the 101-year-old brand with a nationwide boycott. Even worse, New Balance found itself on a website called Grab Your Wallet, which encourages retail activism in the form of boycotting companies that do business with the Trump family or have pro-Trump leadership. To date, there are 64 company names on the site and an estimated 700 million active viewers. In the months following the New Balance story, companies have been more – not less – inclined to speak out on political and social issues. For example, after President Trump announced his executive order banning travel from seven countries on Jan. 27, a plethora of brands rushed to denounce — or praise — the decision. Nike Inc. (NYSE: NKE) Chief Executive Mark Parker released a statement that condemned the action, citing support of Nike-sponsored athletes that were born in Muslim-majority countries as the reason for the outrage. Starbucks Corp. (Nasdaq: SBUX) CEO Howard Shultz publicly opposed the ban and pledged to hire 10,000 refugees at the coffee giant. 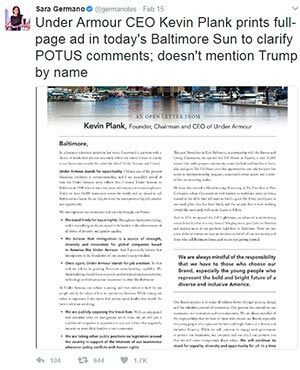 And just this month, Under Armour Inc. (NYSE: UAA) CEO Kevin Plank candidly praised Trump's pro-business agenda, then subsequently took out a full-page ad apologizing to consumers in The Baltimore Sun after an abundance of negative backlash. "It's as if America's corporate leaders have suddenly decided that advocacy is more important than profits," Forbes reported on Feb. 1. "Or conversely, they're being savvy, recognizing that we're so divided as a nation at this point that consumers want to know whether they're buying red or blue." Branding experts predict that while businesses should be wary of speaking out against the president, the implications of doing so are usually superficial. "The boycotts will do minimal damage to the retailers' bottom lines and long-term reputations," said Robert Passikoff, founder of Brand Keys, a marketing research firm that has studied Trump's brand power for the past 25 years, to Business Insider on Jan. 21. In fact, Nike stock has seen an increase of 9.22% since Parker's remarks last month – from $53.10 to $58.25 today. Starbucks shares took a slight 0.92% dip after its announcement, but have since rebounded 3.84%. And Under Armour is up 6.41% – from $20.66 to $21.90. 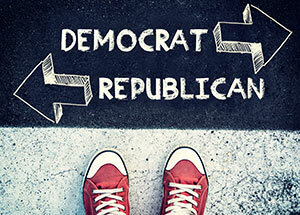 Whether brands decide to identify right, left, or in-between – the long-term result will most likely be minimal. Money Morning Chief Investment Strategist Keith Fitz-Gerald, a seasoned market analyst with more than 30 years of global experience, suggests traders focus instead on what the movement really represents when the political brouhaha starts. "Protests that do the unexpected are what you want to focus on. They're the ones that matter because it's the unexpected that makes stock prices move," Fitz-Gerald told his readers on Jan. 25. "The next time you see dissent brewing, don't just throw up your hands or rush out to join the fracas," he said. "If you're an investor, wait until the storm blows over and buy at a discount." Follow Money Morning on Twitter @moneymorning or Facebook.